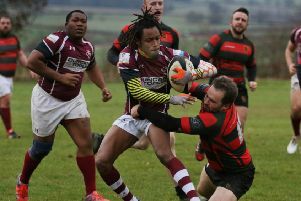 Melton RFC Third XV were pipped by a point as they went up against Merit League leaders Shepshed on Saturday. Against in-form opponents and following a few disappointing results, Melton knew they had perform well, but with home advantage and Shepshed only able to muster nine players, the fixture looked weighted their way. Whelbourne, Heywood, Martorano and Marman swapped sides to help the visitors make up the numbers for a 13-a-side fixture. Shepshed’s early attacks were stunted by excellent tackling from Buckley and Simpson, while Melton soon showed their dominance at the scrum, even with the additional weight of Melton reinforcements in the Shepshed pack. But once clear of the scrum, the visitors started to show their dominance, with great ball handling and pace from the back line putting Melton under pressure. The hosts soon succumbed, conceding a cheap penalty at the ruck, and a good line from Shepshed’s outside centre through a fractured defence put the visitors ahead. Melton hit back from the restart, and with Shepshed under pressure in their own 22, the home forwards’ crash ball onslaught eventually saw Simpson over the line and under the posts for Melton’s first try, converted by Farish for a 7-5 lead. The game became end-to-end, with both teams crossing the try line, including a score from Carter. But Melton gave Shepshed the upper hand through mistakes and unnecessary penalties. Excellent running from White and Carter took Melton deep into Shepshed’s half, but poor handling ended the move as the visitors took a slight lead into half-time. The hosts started to learn from their first-half mistakes by keeping the ball tight and dominating at the breakdown. Effective recycling made the hard yards before Buckley went over for his first Melton try. The deficit was reduced, and hope rekindled, but precarious positioning by Budd around the breakdown forced them back, and combined with other infringements, gave Shepshed useful territory. A well-executed lineout saw Shepshed’s outside centre breeze through to score another try. Carries from Keightley, Potter and Buckley took Melton back upfield, while Farish, Budd and Simpson stabilised the breakdown, allowing Bowles and Kerr to break through gaps at pace. With five minutes left, Melton trailed by just a point and knew the chance was there to end Shepshed’s unbeaten record. The hosts continued with the phase rugby, but the forwards left Gifford exposed and the danger was cleared. Knowing the next lineout was to be the last play of the game, Bowles rose to win the lineout against head, and give Melton a final chance. 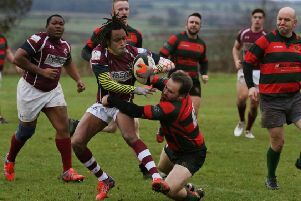 The ball was carried forward with gusto, but the breakdown was poorly defended, allowing Shepshed to win back possession and finally kick into touch to seal a 27-26 win. Melton’s Third XV are next in action on Saturday, December 15 at home to Birstall.